The Epson PowerLite Home Cinema 3500 is the newest home entertainment projector from Epson and has already been attracting a lot of attention. Priced at $1,699, the Home Cinema 3500 has a lot to offer: 1080p resolution, high light output, powerful speakers, and the excellent zoom and lens shift that folks have come to expect from mid-range Epson projectors. The Home Cinema 3500 is not the only projector in this new line. Epson released the Home Cinema 3600e ($1,999) with WirelessHD and the Home Cinema 3000 ($1,299) which is the replacement for the Home Cinema 8350. As the mid-range model, the Home Cinema 3500 offers a killer picture for rooms with ambient light, and its high brightness is a boon for big-screen 3D movies. The Home Cinema 3500 establishes its home entertainment bona-fides right up front with a brilliantly bright image. The 2,500 lumen rating is conservative, at least on our test unit, and performs very well in rooms with ambient light The other thing that immediately grabbed our attention was the sound. The Home Cinema 3500 has two 10W speakers that are much larger than those found on some other projectors, giving it a clarity that is unusual for on-board speakers. In the past, Epson has released several home video projectors with impressive sound, and it's good to see them continuing the tradition. Even in a bright room, the Home Cinema 3500 has enough power to light up a fairly large screen. At 100" diagonal, the picture never seemed washed out or dull, despite significant ambient light in the room. During peak daylight hours, some might want to shrink the screen down to a more modest 80" diagonal to maintain good contrast, especially if your living room is covered in windows like mine is. But this trade-off is a matter of personal taste. With the lights off, the sky's the limit as far as screen size is concerned. This can be quite dramatic, especially when you zoom the projector to fill up the entire wall and gather the family for movie night. One thing not mentioned is the replacement lamp cost. The ELPLP85 lamp for the 3000,3500,3600e is only around $125.00, well below the $200-$400 of most lamps. That will hopefully keep users from trying the hideous 'compatible' cheap generic lamps. Too bad about the fan noise. I really get the impression most critics exclusively watch high amperage action films. Sound is just as important in media appreciation and when low dialogue, music or silent scenes are ruined by a fan sound it's a real drag. 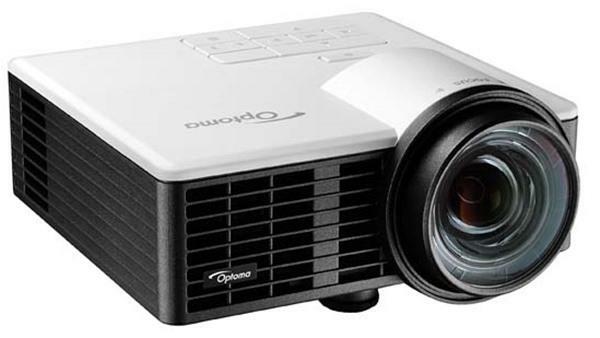 If powerful PCs can be made silent, projectors can be made silent too, with large slower moving fans and other techniques (this is especially strange when it comes to LED projectors). Instead I think the industry prefers to artificially create levels to the detriment of many people. So if I read correctly, this would not be a good projector for a light controlled home theater room? I really like this projector. Set it up in our small cinema room. 13ft throw. 113 in diagonal picture. Easy to do because of the horizontal and vertical lens shift. It is very bright but using eco mode it seems just fine and of course bright enough to watch in the daytime which we rarely do. It sits right behind me and I really don't notice the fan noise. Great color and 3D. I'm not a connoisseur but am very happy with it. Thanks for reading the review, everyone. EeeTee: at the time we wrote this, the lamp price had not yet been published. Epson has now set lamp pricing at $149, which is indeed lower than most other projectors. davidm: PCs can indeed be made silent, but PCs draw far less power than projectors do, and PC components create much less waste heat than projector components do. While LEDs certainly run cooler than traditional lamps, the other parts of the projector are still the same. Furthermore, there are plenty of near-silent projectors, but the inexpensive models still make noise, much like inexpensive PCs tend to be noisier than higher-end models. Jeff: Depending on your screen size, it might be much too bright. That's the main concern. Buck: Glad to hear it! Enjoy your projector! p c: We are still waiting on the Home Cinema 3000, and we will certainly compare it against the 3500 when we write our review. I never had 3D LCD or projector before, so my only concern is comfortability when wearing active glass ..... flickering, weight and eye tiredness. Does this projector require silver screen? My current setup is 2D projection on 3.7m x 2.4m wall (about 175 inch). If it does, then the screen would be more than the projector itself ! Thanks. Is it possible to provide a measurement of the lens assembly? I need to add an ND2 filter, and am curious if a 72mm filter will work, or if I need a different size. I realize mounting will be a challenge, but if a 72mm fits in the lens assembly, that might work with a bit of tape :-), or if have to get bigger and build some sort of sleeve over it. Was going to buy one..until a friend did and the picture was grainy. Is that normal? I have read great reviews but nothing about poor picture. The grainy-ness would bug me. I'm sorry but after having this PJ set up for 4 hours I'm not impressed. There is something about the "noise" in the picture-- especially in faces. With the "super rez" set to "0" the image appears "super soft" with it at "2" even it appears artifically enhanced. Anyone have a lead on some calibrated settings? I currently have the sharpness to -4 and on cinema, is all. Really hoping I can turn this thing around as the Panny AR100 that it replaced has it beat; hands down, so far. I currently have a Hitachi PJ-TX200 projector which has problems with it's LCD panel so I'm looking for a new projector. Unfortunately, the city that I live in doesn't really have stores that sell projectors so I would most likely have to buy a projector without seeing it action first. Since the PJ-TX200 has worked fine until now, I haven't really followed the projector market for like seven years so I'm not sure what to expect from todays projectors. The max amount that I can spend for a projector is like 1500 euros and due to the placement of the projector there is also a weight limit of approx 7 kilos. The price and weight already rule out a bunch of projectors. This Epson Home Cinema 3500 seems to be the one that I'm leaning towards, but maybe it's because I haven't discovered good alternatives. I think I need the projector to be an LCD one instead of a DLP since the possible rainbow effect would bother me too much. Then there is the question about the audible noise of the projector. My home theatre setup is so that the projector is located on shelf approximately 50 cm above the sofa so quite close to the viewers. This, unfortunately, I cannot change. My current PJ-TX200 projector has an audible noise of 28db, which I've become accustomed to and doesn't bother me even with quite movies. This Epson one has the noise listed as 35 db. Is 7db a big increase, considering the that the projector is quite close to the viewers? In "ECO" mode the Epson generates 24 db noise. In the review a "Medium" mode is also mentioned but not it's decibel level. I'm curious about that. Help! Im thinking of buying the epson 3500 but I know NOTHING! Got a screen with a 130 inch screen as a gift. Its for outdoor use only. Has anyone had any outdoor use with this? Any advice will b greatly appreciated! Epson 3500 11ft distance with aprox. 104" diagonal in a small room with white walls and average light control. I originally tested with a matt white 1.0 gain screen and the light reflecting back from the white walls was washing out the image even in eco mode. I switched to a Carl's FlexGray screen with an approximate gain of 0.9 and it has made a huge difference even when I have a lamp on in the room. I still use it in eco mode to maximize black levels and it is quite brite in my preferred modes (Natural and Cinema). I did find that for some content it is preferable to boost the gamma as high as 2 in order to improve shadow detail. With the FlexGray screen you can boost gamma without washing out the image. I am getting samples of the Carl's silver and ProGray screens next week and I will also be comparing them to a Da-Lite High Power 2.8 because the Da-Lite does a great job of not projecting ambient light back towards the center of the room where most people sit. A 2.8 is useless in my small room, but under the right circumstances a high power silver screen may be useful even with a projector as bright as this one. Does Eco mode bright enough to watch 3D movie in dark room? Since you said the home cinema 3500 put out way too much bright in dark room.According to the review of HC3000,should the home cinema 3000 which is 500 less lumens in cinema mode be a better choice? Thanks! Quick question. I'm used to having the projector fan run for a few minutes after shutdown supposedly to aid bulb longevity. This projector just shuts down. Am I doing something wrong? Did a installation of this model. It does NOT support dual HDMI inputs for Picture-in-picture as your review stated. It's like the Epson 3020 that uses analog composite, component or PC as 2nd input for P-in-P. The HDMI is grayed out as option in P-in-P source menu. The Epson 5030 however does support dual HDMI inputs. I've owned the Epson 2030 ($699) for 2 years and I've been pleased with it, I wanted to upgrade but was afraid I'd be wasting money, let me tell you the Epson 3500 easily outshines the 2030 and it wasn't a waste of money ($1099). The 3500 has a sharp, well defined picture with colors that pop! Very bright projector even in ECO mode. While this projector might be loud in full power mode it was almost too bright in ECO mode (including 3d) so there was no reason to ever use it. I strongly considered keeping this projector given its value for the price but have moved on to trying more expensive models. The biggest downside I saw and main reason for return the the 3500 was motion blur and lack of sharpness on text. Text had significant pixelation compared to my much older 1080p H9500BD dlp projector and the Epson 5030ub. Motion blur was also apparent at times (fast motion would sometimes have streaks) which did not exist on the DLP units or higher priced LCD units such as the 5030ub and ae8000u. The projector also lacked frame interpolation so some highly compressed content that has judder issues could not be smoothed out. I hate both judder and the soap opera effect so this limiation made me move to a higher end unit. If this unit had frame interpolation for those times when judder is just too much I probably would have kept it. For 3D this is probably the best sub $1500 projector out there due to its superior brightness.